Author’s note: This is the second installment of a three-part series of articles. J.I. It was an intense blaze that broke out on a cold winter’s night in the very heart of Greenville, at an hour when most citizens were snug in their beds. When it was over, two prominent landmarks had been destroyed, six businesses and the post office were gone, and three families were left homeless. Had it not been for the brave efforts of volunteer firefighters, it could have been much worse. Try to picture the village of Greenville as it looked in the early years of the 20th Century. There was the town common, somewhat larger than it is today, crowned by the picturesque Baptist Church, and lined with 19th Century buildings that have since been replaced by parking lots, or newer structures. A barn once stood where the Greenville fire station is today. The famed Waterman Tavern stood just to the right of it, still looking much as it did the day it was built with its frontal portion still intact. Route 44, known then as the Powder Mill Turnpike, was still an unpaved, two-lane road that was periodically sprayed with oil to keep the dust down. The old Smithfield Exchange Bank still stands on Route 44 at the intersection of Smith Avenue. In 1924, the village fire apparatus, consisting primarily of an ancient hand-pumper, was stored in the basement of this building. Next to Battey’s store stood a large wooden building containing five businesses, one being an automobile repair shop belonging to A. Howard Hopkins. Like most of the structures in Greenville at the time, the building was an old one with dry timbers and oiled floors; perfect fuel to feed the beast. It is there that the fire started. Shortly before 4 a.m. on January 23, 1924, William Kelley happened to look from the window of his apartment above the old Smithfield Exchange Bank, and saw flames shooting through a window of Hopkins’ Garage. He quickly made his way to the basement under the bank and activated the fire siren. Its lonesome wail droned throughout the village calling volunteers from their warm beds into the frosty night air. As the men left their homes still groggy from sleep, they could smell the smoky haze that was beginning to hang over the village, and knew their slumber had not been disturbed for nothing. Kelley and others pulled the antique fire engine from under the bank and maneuvered it across the street. Greenville had no fire hydrants then, and the most obvious source of water, Hopkins Pond directly behind the burning auto garage, was frozen over. As men swung axes to break through the ice, others dragged a suction hose to the shore. While the firemen worked furiously to gain access to water, the flames spread to the Wheelwright shop next door, and then to Thornton’s Ice Cream shop, likely traveling unchecked through the building’s common loft. By the time water was brought to bear the fire was out of control, and the primitive fire apparatus lacked the capability to halt its progress. His grandfather agreed to pay, for what choice did he have? It was clear the fire was going to spread unless more help arrived. One engine from Johnston came on the scene and took up a position beside the Greenville men. Shortly afterwards, the heat of the flames broke the overhead power lines causing them to fall across Route 44 near the intersection of Pleasant View Avenue. According to Mr. Battey, when volunteers from Centerdale arrived they refused to go any further due to the downed power lines. An engine from Providence arrived a short time later, but stopped when they encountered the Centerdale crew. Radio communications for fire departments were non-existent in that era, and when the telephone lines went down any more calls for assistance became impossible. Newspaper accounts relate that firemen did their best to attack the flames and stem their progress, but fire breathes and consumes like a living being, and despite their best efforts the flames broke past all barriers. Before long the entire building was ablaze, with flames now consuming C. E. Walcott’s blacksmith shop and Keach’s paint shop. The flames then jumped to Battey’s general store, igniting the clapboards, and racing across the wood-shingled roof. Before long it too was beyond saving. Those who had been evacuated from the apartments above the store took refuge in St. Thomas Church across the street, but the wind pushed flames and embers towards the church’s roof and bell tower threatening to destroy that building too. About a thousand feet away on Austin Avenue stood a woolen mill now occupied by Cortland Place assisted living. The mill had its own fire hydrants, and steam-pressure fire-fighting system. 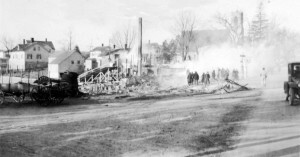 Hose was laid from the mill to the fire scene where volunteers took up a defensive position on Smith Avenue between the church and general store spraying down the church roof and that of the parsonage behind it to halt the fire’s progress. Meanwhile, other firefighters continued to attack the flames in what was now a “surround and drown” operation. The fire burned so hot that the icy pond water turned to steam as it hit the flames, sending out tiny water droplets that hung in the air and formed icicles on the firemen’s leather helmets and mustaches. It took two more hours to bring the conflagration under control. When it was over, both buildings were a total loss, but fortunately nobody had been hurt, and St. Thomas Church, although scorched, remained intact. The cause of the fire was never determined. Fortunately much of the loss was covered by insurance, and new buildings were constructed on the old sites. Had the fire taken place just two months earlier, Smithfield would have lost more than just buildings, it would have lost a good portion of its history, for up until November of 1923, all of the town’s records, including land deeds, birth, marriage, and death records, had been stored in the general store. 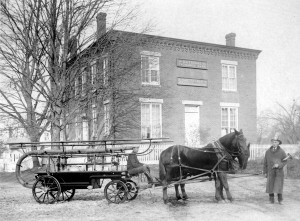 The devastating fire also proved to the citizens of Greenville that it was time to establish a modern fire department. 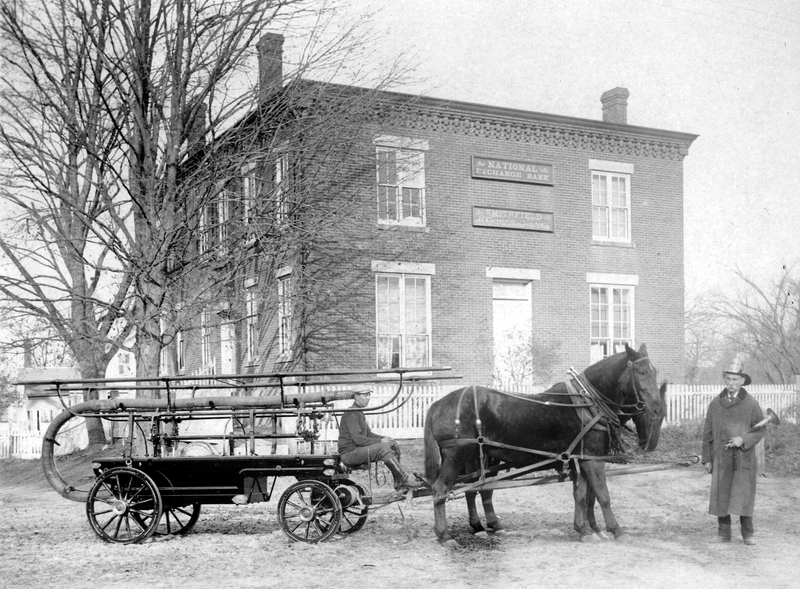 The old “Water Witch” fire engine dated to the 1860s, and was obsolete even when it was purchased from the City of Pawtucket in 1876. The following year, a 1924 Reo fire engine was obtained, giving Greenville its first motorized fire apparatus.